Proper Hunt: Gobble Gobble. I Mean, Happy Thanksgiving! Gobble Gobble. I Mean, Happy Thanksgiving! 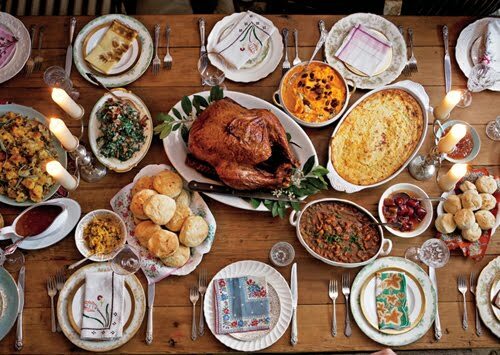 Doesn't this photo of a no-frills Thanksgiving table really define what the holiday is all about? An abundance of amazing food to enjoy with family and friends in celebration of what we're all thankful for. Ever since Victoria was born (6 months ago, can you believe it?! ), my family and I have felt blessed beyond words to have her in our lives. This year I am especially excited for Thanksgiving because this one will be her first. Now, I realize that she's just a tad too young to know what's going on, but my grandmother is flying in from Hawaii to celebrate Thanksgiving and Christmas with us. So we'll have all 4 generations of women in our family all together at the same time this year! Can't wait for Thursday! This might be one of my only posts this week (I'm working on an e-decorating project for a client, yippee! and it's turkey week), but I'll still be pinning on Pinterest and Instagram'ing (I finally joined!) so follow me! Thank you all so much for reading my blog - I am so grateful that you take interest in my ramblings on interiors and everything else in between. I hope you all have a wonderful Thanksgiving full of good food and great times with loved ones! Happy Thanksgiving!